(AP) BEIRUT - The head of Syria's main opposition group in exile called Sunday for international powers to impose a no-fly zone in border areas to protect civilians who are coming under increasingly intense attacks by regime warplanes and helicopters. The president of the Syrian National Council, Abdelbaset Sieda, told The Associated Press that such a move by the international community would show President Bashar Assad's regime that his opponents around the world are serious. The Syrian opposition has been calling for a no-fly zone over Syria for months. But Sieda renewed the plea a day after U.S. Secretary of State Hillary Rodham Clinton said Washington and Turkey were discussing a range of steps including a no-fly zone over some parts of Syria as the regime increasingly uses its air force to attack rebels. "There must be special protection," Sieda said by telephone. "The numbers of martyrs are increasing and destruction too. If the country keeps going this way, then we are heading to a catastrophe." Asked who will impose the no-fly zone, Sieda said: "We leave it to the international community." Sieda said the no-fly zone should be along borders with Jordan and Turkey, adding that the opposition had called for such a move during last month's Friends of Syria meeting in Paris attended by world powers. "Now that Syria's air force is taking part in bombing cities and towns, there must be protection for the Syrian people. There must be a no-fly zone so that there will be safe havens to refugees," he said. Syria's civil war has spread to almost every province in the country and the death toll has increased over the past weeks. Activists say more than 20,000 people have been killed since the revolt against Assad's authoritarian rule began in March 2011. Activists reported more clashes Sunday in some Damascus suburbs, the battleground city of Aleppo in the north, central Homs province, and the restive southern town of Daraa. 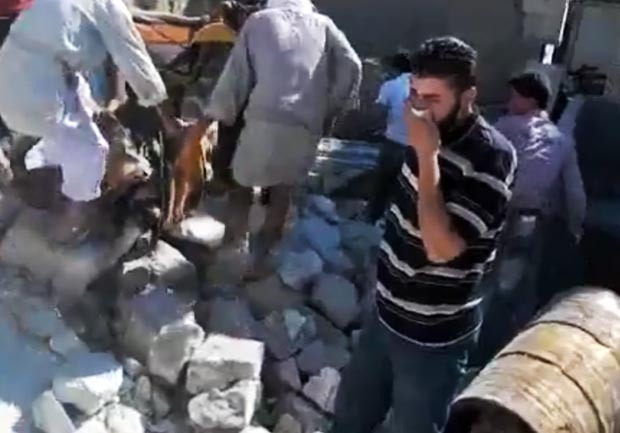 The U.K.-based activist group Syrian Observatory for Human Rights said it had no immediate reports of casualties. The deaths of two Syrian journalists on Saturday were reported on Sunday. State-run news agency SANA said one of its reporters, Ali Abbas, was killed at his residence in Damascus. The report blamed an "armed terrorist group" - the regime's catch-all term for its opponents - but gave no further details. Pan-Arab satellite news channel Al-Arabiya television said that Bara'a Yusuf al-Bushi, a Syrian national and army defector who worked with the station and several other international news organizations, was killed in a bomb attack while covering a story in al-Tal, a suburb in northern Damascus. Journalists have suffered a number of casualties in the uprising, and in recent months there have been several attacks on pro-regime media. The Observatory said that government forces were able to retake the northern town of Ariha, in the restive Idlib province, that had been under rebels control for months. The group said troops backed by tanks entered the town late Saturday and quoted witnesses as saying that many people were detained and some were the victims of "summary executions." Also Sunday, SANA said troops killed Wael Mohammed al-Majdalawi who is a leader of the Sunni group al-Nusra Front, that claimed responsibility for deadly attacks over the past months including last week's killing of a prominent Syrian television broadcaster, who had been reported missing since July 19. In a video released Sunday, Capt. Abdul-Nasser Shumeir, who commands the rebel "Baraa Brigades" said government troops launched two attacks in an attempt to free 48 Iranians they have been holding for 10 days. He said Assad's regime is responsible for the safety of the Iranians adding that any negotiations for their release should come after government forces lift the siege imposed on rebel-held areas. He also called on the Iranian people to pressure their government to stop its support to Assad's regime. Rebels claimed the men are military personnel, including some members of Iran's powerful Revolutionary Guard, who were on a "reconnaissance mission" to help Assad's crackdown. Iran, however, says the group was pilgrims visiting a Shiite shrine in Damascus. Syrian state news agency SANA also reported that security forces ambushed an armed group in Aleppo and killed and wounded some of them. It said that al-Safira residents in Aleppo prevented gunmen riding in five cars mounted with machine guns from entering their area. The Observatory said three children, whose ages were between six and 11, were killed Sunday when a bus they were fleeing in with their parents from the Shammas neighborhood of the central city of Homs came under fire. It said government troops were conducting operations in the area. In Cairo, the Arab League said an emergency meeting of Arab foreign ministers on Syria that had been scheduled for Sunday in Saudi Arabia has been postponed. It did not say why the meeting was postponed or give a new date.